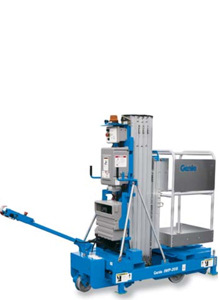 Genie IWP™ Super Series lifts (Industrial Work Platform) can easily move around the worksite and setup is fast. A quick and easy solution for contractor and maintenance applications. Genie IWP is quick to set-up and simple to operate. Genie IWP is choose from two bases (standard or wide*) and four platform options. Genie IWP have rigid aluminum mast designed for strength, reliability and low maintenance. Genie IWP have automatic level sensing with integrated leveling jacks and no outriggers needed. Genie IWP is auxiliary platform-lowering feature on both platform and ground controls. Genie IWP is designed to easily roll through standard doorways.